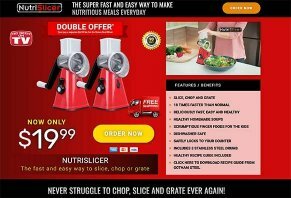 NutriSlicer Reviews - Is it a Scam or Legit? NutriSlicer is a drum-based rotary food mandoline that features three stainless steel blades, the ability to lock onto your counter in seconds, and dishwasher safe cleanability. NutriSlicer combines three interchangeable blades, a suction lock system, and a precision power handle to help you safely slice, chop, or grate vegetables, cheese, and fruit up to 18 times faster than normal in a single turn. The website advertises you’ll just lock it to your counter in seconds, insert the appropriate stainless steel drum blade, and you’ll be able to quickly make deliciously healthy homemade soups, tasty salads, scrumptious finger foods for the kids, along with other nutritious snacks and meals. And when you’re finished, the drums are dishwasher safe, while the plastic chute can be rinsed in the kitchen sink. Based on what we viewed in the commercial, NutriSlicer seems like it could live up to its claims of making slicing, chopping, and grating easier. But, is it necessarily the best tool for the job? This is the central question we’ll help you answer in this brief article, starting with the price. How Much Does the NutriSlicer Cost & Where Can You Buy? If purchased through their As Seen On TV offer, one NutriSlicer will cost you $19.99 (S&H is free), while picking up a second device during checkout will cost you an additional $6.95 fee. We also found the device sold through Amazon for $24.95, as well as Bed Bath and Beyond for $19.99 (including in-store pickup, depending on location). All direct orders also come with a nutrition guide. We reached out to customer service at 866-248-9853 looking for additional details (e.g., length, what kinds of information it includes, whether or not it’s customizable based on diet, etc. ), although they weren’t able to provide further insight. Nonetheless, direct NutriSlicer purchases come with a 90-day money back guarantee, less S&H. Third-party refund policies will vary by retailer. Based on these prices and availability, let’s find out what customers are reporting about the NutriSlicer. What Can We Learn From NutriSlicer Customer Reviews? Between Amazon and BedBathandBeyond.com, we encountered a total of 15 customer reviews for NutriSlicer, who had given the device an average rating of about 3.5 stars. Common compliments related to ease of use and cleanup, while most of the relatively few complaints revolved around less-than-stellar functionality (specifically, that it tends to smash fruit instead of cut it) and flimsy quality. NutriSlicer is manufactured by E. Mishan & Sons (EMSON, Inc.), a NYC-based company with an A Better Business Bureau rating, despite holding a total of eight negative customer reviews and more than 90 closed complaints, as of 3/28/18. Common topics (when details were available) seemed related to product quality and customer service concerns. In addition to hundreds of other products, EMSON is also the company behind the very popular Gotham Steel brand, with additional offerings in the lineup including the original Gotham Steel Pans, along with Double Grill, Crisper Tray, Smokeless Grill, and Knives. Are There Other Rotary Drum Food Mandolines Like NutriSlicer? NutriSlicer is obviously a specific brand. However, if you zoom out and search marketplaces like Amazon and Google Shopping for a broader, all-encompassing term like “round mandoline drum slicer,” you’ll find several other products designed meaningfully the same. Given the similarities in their designs, their overall average customer feedback, as well as the companies’ marketing claims, we can see that the differences between them largely come down to three core factors: price, color, and the availability of a lifetime warranty. And the emphasis you place on them can go a long way toward potentially finding your best option. For example, at just $19.99 and with free shipping (not to mention that you can get a second for an additional $6.95), NutriSlicer seems to be the lowest option. However, it’s also only available in red, so if you’re interested in something else, you might need to look at models like the Upintek, Benwish, or Edofiy models. Finally, only Upintek, Zollor, and Zacfton offered lifetime warranties. We think it’s important to point out that if you’re willing to move outside of drum-based designs, you’ll have a much wider variety of food mandolines to choose from. In fact, Foodal’s recent mandoline buying guide doesn’t reference any drum-based models, so other than overall size, there might not be much of an advantage to using one. In fact, for about the same price as NutriSlicer and its similar competition, you can purchase entire traditional mandoline sets that feature as many as seven interchangeable blades. And since many of these models fold flat (except for those with catch basins, of course), they might actually take up less space than the product in question. With all of these details in mind, let’s bring everything together, summarize, and help you come to your own conclusion about NutriSlicer. According to ChooseMyPlate.gov, vegetables provide a variety of benefits. They’re “important sources of many nutrients, including potassium, dietary fiber, folate (folic acid), vitamin A, and vitamin C,” can help maintain healthy blood pressure and cholesterol levels, and can reduce the “risk for heart disease, including heart attack and stroke,” to name just a few. So, if a device like NutriSlicer increases the amount of vegetables you eat, it stands to reason that it really could help you create healthy family meals, as claimed on the website. However, the manufacturer doesn’t provide any data to support the claim that it can work up to 18 times faster than normal, so we might recommend taking it with a grain of salt. And despite its mostly positive—if not fairly limited—online customer reputation, we also didn’t encounter any rotary drum food mandoline comparisons on professional cooking websites during our research. As such, we’d also recommend maintaining realistic expectations about how much value it might provide compared to more traditional designs. One final consideration is that, although the manufacturer backs NutriSlicer with a 30-day refund policy, it’s not a risk-free transaction, since you’ll have to pay to ship it back to the manufacturer. You’ll also lose any fees associated with the BOGO offer. I would like my money back. Does anyone know how to reach them for a complaint? I tried it twice. I tried some butternut squash, the handle was VERY hard to turn. I got it because my right arm is damaged, and doing slicing can HURT. Was hurting for a week. After washing it, it would not work. Very hard to put together, could not put the handle on, when I finally got it together, then discovered the drum was too big for the cone. This slicer is supposed to handle slicing, chopping, and grating. It would not even do peppers, let alone carrots. As I turned the handle, it popped off and then the base came loose from the counter (supposed to be locked down). All blades are dull and they said how sharp they would be. Overall, a scam and lies. I tried to call the number on the Visa statement, and it said that the call cannot be completed. No phone numbers work and there is no way to get my wasted money back. Do not buy! I've done so many of these As Seen On TV products, it's not even funny. I've NEVER had one work yet as described! I would give it NO stars but have to give one (product BS) just to give a review on this. This is a scam, a quick money making scheme by some fraud stars! The website says $29.99 and does not give you another one free as advertised on TV. If you call the number the order is taken over recording and it will keep signing you up for products and services that you do not want and the system does not provide any option to decline them. Total fraud and scam! I had high expectations for this device. I waited several months for the delivery. What a piece of junk, it will only cut hard vegetables, carrots in particular and celery, onions make mush out of them. I'm very disappointed. A real piece of crap! What a disappointment! The item does not stick on the counter too long. The "sliced" items come out watery, thin and uneven. The way this was advertised on TV is not the way I experienced it. I would have been okay with the quality if I paid about $5.00 or less, which may be the actual value of this item. Not only would I not recommend this to a friend, I would not recommend it to an enemy either. I grated some zucchini when I first got it - very below average results. Messy, and zucchini got stuck. I took it out to use it the following day to again grate zucchini, and it broke. The suction did not work, and the handle kept coming off. I threw it out into the trash. Don’t waste your money. Total crap. I purchased this on Publishers Clearing House. The metal grating cups are so cheaply made that the slicer cup I used one time got dented from pushing the vegetables into it for slicing. Plus the slices of zucchini I was working with got stuck between the cup and the housing. Very uneven slices, and not built to withstand the pressure you need to apply. So the $19.95 + S&H $7 = $27 I just threw into the trash. The manufacturer is in China. They apparently do not test the products. I had to call three weeks after the order to be told that it will be shipped in coming two weeks! Then finally it was shipped through FedEx SmartPost that never got delivered (says delivered last week on the tracking). I called FedEx and then the local post office and then the carrier that the post office provided the number for. No dice. I wasted my time and money. Never again. This piece of junk is not worth $1.99 much less $19.99. It does not work! I tried to slice potatoes with it this morning, and I would still be slicing if I had continued to use this piece of junk. In the 1950s my mother had a similar product made from metal. It worked like a dream. I I use this product yesterday soon as I got it and it destroyed my tomatoes, lemons, grapefruit, and oranges. All I get was juice and all the fruit was smashed into the machine. This does not work at all. Save your money, do not buy, it is a scam. On top of that, they make you pay to ship it back if you want a refund, and it is half the money that you pay for it. Don't buy. Write a Review for NutriSlicer!